Allianz Malaysia is rallying together the Malaysian public to catch irresponsible drivers in the act. Allianz Malaysia added that the MyAID movement is said a far-reaching campaign which uses social media to create public awareness. The integrated campaign will be rolled out in many phases throughout the year, with the first phase being launched yesterday. 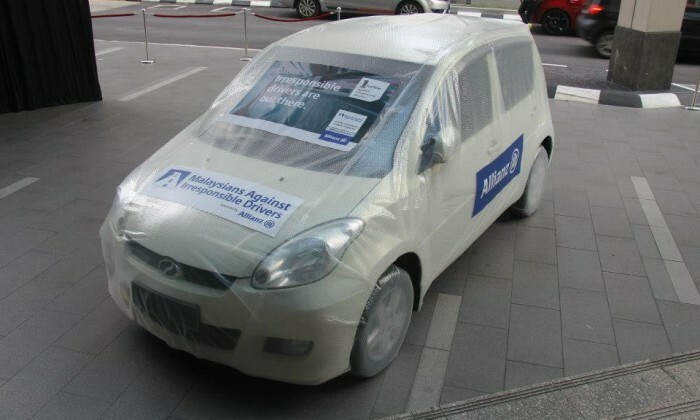 Employees at Allianz Malaysia were greeted with a bubble-wrapped car at the foyer of company headquarters in Plaza Sentral, Kuala Lumpur. The stunt emphasised the message that people do not need to go to such extremes to protect their car, as long as they do their part to join the movement to stop irresponsible drivers. Allianz Malaysia employees were then encouraged to download the MyAID app on their smartphones. “The MyAID app helps to capture irresponsible drivers in action with the phone’s video camera. Uniquely, it is able to record an incident even if it has passed. A simple tap of the screen captures the past 30 seconds of an incident automatically, with an option to continue recording by tapping the dedicated record button,” said Zakri Khir, CEO of Allianz Malaysia. “Irresponsible drivers are out there and it’s time that we stood up to them with the MyAID movement. The purpose of this movement is simple. To make Malaysian roads safer so that all of us can reach our destination safely,” said Zakri Khir, CEO of Allianz Malaysia. Advertising + Marketing has reached out to Allianz Malaysia for more details on the campaign.